Pureforet is derived from beauty theme park that realizes healthy and lively skin with natural cosmetics which utilizing valuable nature-oriented ingredients. 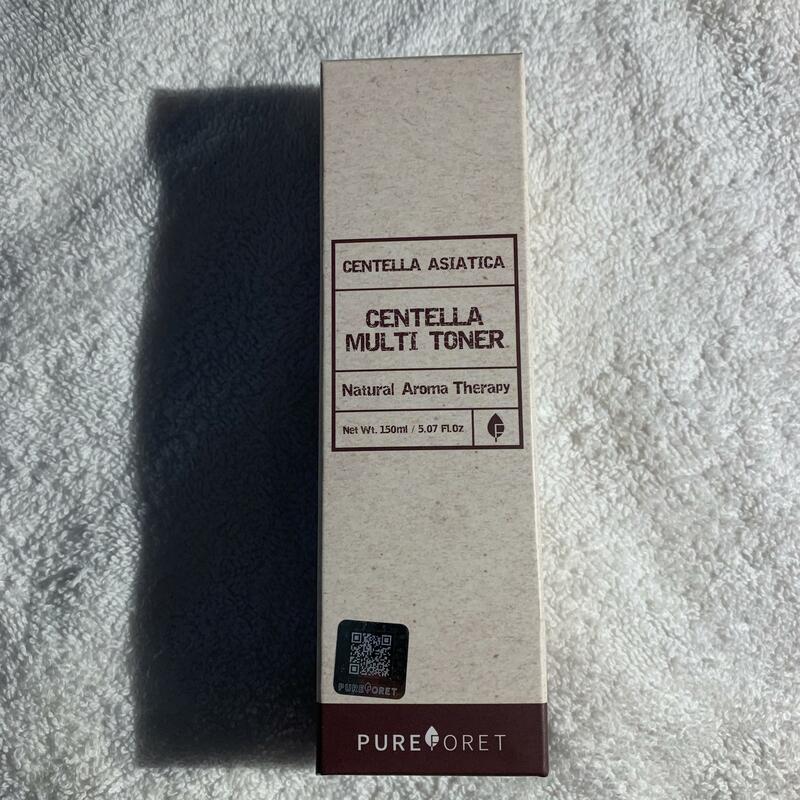 Radiant your Skin Care with the [Pureforet] Centella Multi Toner 150ml! we aim to provide you best korean products to take good care of your skin, including Cosmetics, Skincare, Toner. Hydra Toner online. The strong antibacterial and regenerative power! 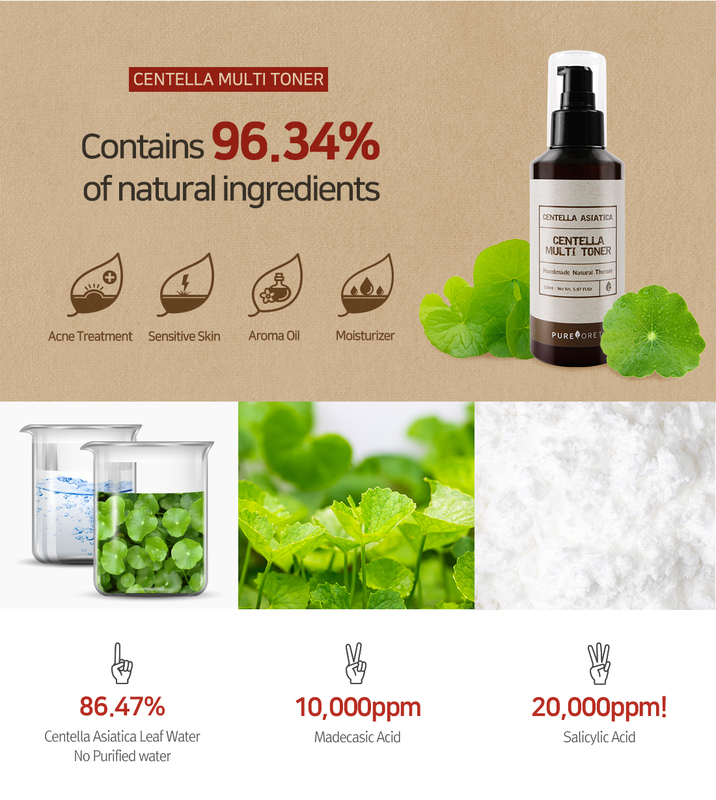 Centella Asiatica created mild skincare product, Centella Multi Toner, for the acne-prone skin. The plant is also called “Tiger grass”, because tigers rolled on the grass to heal their wounds after a fight. The madecassic acid in leaves and stems of Centella Asiatica has excellent healing effects on inflammation and wounds. It is used in ointments or cosmetics for contact dermatitis, acne, and inflammatory skin problems. Four essential ingredients like Centella Asiatica Extract, Madecassic acid, Willow extract, and Tea tree oil work in synergy. They suppress bacteria that cause skin problems, remove unnecessary dead skin cells, and intensively heal the skin. Tea Tree, Lavender essential oils are contained in this Centella Multi Cleansing Water. This all in one cleansing water is effectively removes makeup, cleanses skin and refreshes. Centella asiatica extract soothes the irritated skin. Do not contain 26 allergens, 20 harmful chemicals in cosmetics, and synthetic surfactant. No artificial fragrance, but aroma oils are contained. Use a cotton pad and apply Pureforet Centella Multi Toner from the center to the outer part of the face with wiping motion. car…@gmail.com Im glad I got it on sale, but I don't like how sticky it feels on my skin. It didnt break me out, but it was not soothing either.